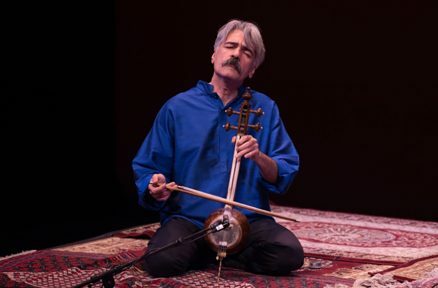 One of Iran’s most beloved artists and the preeminent ambassador of Persian music, Kayhan Kalhor is a soulful master of the kamancheh, the Persian spiked fiddle. Widely known for his stirring improvisations, exquisite compositions, and extensive collaborations with artists including Yo-Yo Ma, Brooklyn Rider, Kronos Quartet, Osvaldo Golijov, Ghazal Ensemble, and many orchestras around the world, Kayhan has popularized Persian music in the West and is a creative force in today’s international music scene. For this concert Kalhor has invited Alireza Ghorbani to perform the ancient and rarely heard saz va avaz (instrument and vocals) tradition, whereby the instrumentalist is accompanied by a vocalist performing improvised songs with lyrics from ancient poetry. This concert marks their NY debut performing together. Ghorbani is a stunning vocalist and considered to be the successor to Mohammed Reza Shajarian, the undisputed master of Persian classical song. They will be joined on tombak (percussion).